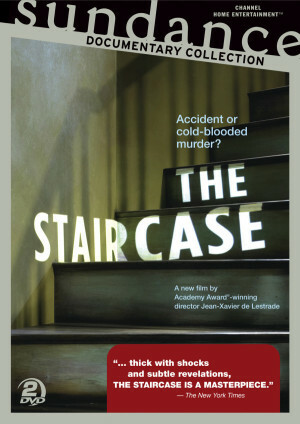 The Staircase is a documentary directed by Academy Award-winning director Jean-Xavier de Lestrade. The version I watched was from the Sundance Channel DVD collection, as it was very difficult to find viewing options for this on any streaming services. If you are a fan of documentaries, this one is well worth adding to your collection. Kathleen Peterson died on December 9, 2001. This may be the only fact that is not called into question in the case against her husband Michael Peterson as it is documented in the film, The Staircase. Clocking in at 6 hours in length, The Staircase is far from your standard documentary. Once begun, it almost becomes physically impossible to stop watching it until the striking conclusion. Details about the twists and turns this shocking case takes are best discovered while watching the documentary. Fans of crime fiction will shake their heads at the various revelations that occur during the trial prep – and in fact during the trial itself. A good fiction editor would put the kibosh on any author’s attempt to squeeze this many surprises into one story; and yet, this is definitely a case where truth is stranger than fiction. The documentary filmmakers had no way of knowing that what seemed like an interesting case was going to become so much more than that over the course of filming. Beyond the details of the case, what is most interesting to watch is how one family deals with this level of stress. Over the course of this documentary, viewers can see the effects this trial has on the physical and mental health of all involved. Because the Prosecution backed out of their original agreement to allow the filmmakers access to their day-to-day activities, much of film focuses on the efforts of the Defense, but viewers can still see the effect on the prosecution team during the trail footage. Many of those involved become real-life characters the viewer will become invested in. This goes far beyond just the immediate family and Michael Peterson himself. Defense attorney David Rudolf is as charismatic as some of our best actors. Key witnesses appear so complex that viewers long to know more about them – autopsy expert, Dr. Deborah Radisch chief among them. Others worthy of interest include: Prosecution co-counsel Freda Black, the victim’s daughter, Caitlin Atwater, and Michael Peterson’s brother, Bill. The machinations of both sides of the trail are fascinating to watch and call to mind the old saying (heavily paraphrased here) “Hot dog making and Law: be careful of looking too closely at what happens behind the scenes.” You simply cannot come away from viewing this film without feeling differently about the justice system as a whole. This is perfect viewing for fans of the Serial Podcast, crime and true crime readers, and anyone interested in the practice of law. We’ll never know what happened on that early morning in 2001, but this documentary goes a long way towards raising doubts on all sides of the argument. My television station ran this series again a couple of years ago. I must check out the latest. Hi Ann. I’m sure this was in my mind. When Laura Lippman and Megan Abbott started talking about it and recommended I watch it, I already had it in my heaad as something I would enjoy. This was likely from you and Erin Mitchell mentioning it. In any case, I’m glad that I finally got around to watching it. I really enjoyed it. Attica Locke commented on my Facebook post and suggested I google The Owl Theory in relation to the crime. I did and I’m not convinced that this is a potential answer to some lingering questions.